In 1874, a School Mill was passed to establish a school district in Fargo, North Dakota. In May of that year, Miss Gillings was hired to teach the children for $45 per month. In 1875, the first school house was purchased for the use of the school, and there were 105 school age children in Fargo, according to the Census records. In 1883, a combination grade and high school building was constructed, which was Central high School . This school building held all grades from kindergarten to 12th grade. In March of 1885, the Dakota Territory Legislature enacted a bill making Fargo an independent school district. In 1886, the first high school graduating class graduated with 8 students. 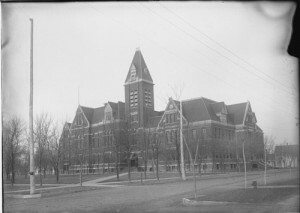 NDSU Archives, Fargo (N.D.) Public Schools Records, 1874-1980.